RIDGELAND, SOUTH CAROLINA — TICO Manufacturing, one of the world’s fastest-growing terminal tractor manufacturers, introduced a completely-redesigned cab for its 2018 terminal tractor models at the company’s annual North American Dealer Meeting held recently in Savannah, Georgia. 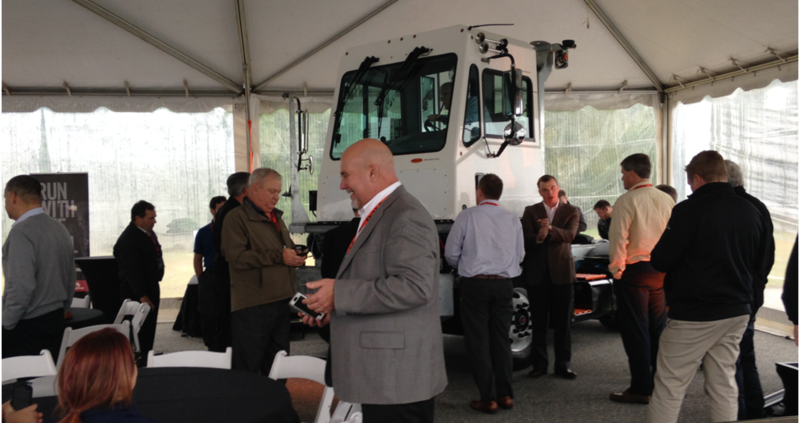 The Dealer Meeting, which was held at the Westin Savannah Harbor Resort, was a three-day event devoted to discussing and demonstrating all of the innovative new features and design elements of the company’s next generation cab. The meeting featured a dramatic reveal of the new cab during the opening session, corporate presentations on its features, benefits and competitive advantages and a half-day Ride and Drive demonstration held at the resort’s closed-course race track. Six new TICO terminal tractors — including its popular galvanized steel version — were made available for the dealers to test drive at the event. A sales event followed the demonstration, at which dealers were given their first opportunity to order the new terminal tractor. Additional activities dealers experienced at the meeting included company presentations on TICO Tractor’s service, parts and financing support, a private evening dinner cruise on the Savannah River, a visit to the company’s manufacturing facility in Ridgeland, city tours of Savannah and golf at the resort’s award-winning eighteen-hole golf course. As a direct result of the enthusiasm generated by the new cab at the Dealer Meeting, TICO secured a record order of over 300 vehicles from one of North America’s leading package carriers. TICO (Terminal Investment Corporation) has been manufacturing its Pro-Spotter terminal tractor for retail availability since 2008. Pro-Spotter terminal tractor sales, service, parts and rentals are available through its North American dealer network. Dealer locations can be found at www.ticotractors.com. TICO Manufacturing is the quality manufacturer of the Pro-Spotter On and Off-Highway terminal tractor, for use in distribution centers, rail terminals and ports, as well as the Pro-Shuttle terminal trailer. TICO terminal tractors are built “For The Real World” in Ridgeland, SC. For more information, please visit www.ticotractors.com.